A tree root invasion in your Southern California pipes can turn into a serious problem if they are not addressed right away. Clogs and backups within your pipe system are caused by intrusions in your pipeline that do not allow water to flow properly through your drain. Roto Rooter Ventura has the experience and tools necessary to properly diagnose your problem and repair it without having to dig trenches across your property. At Roto Rooter Ventura, we service the areas of Calabasas, Camarillo, Fillmore, Moorpark, Ojai, Oxnard, Santa Paula, Simi Valley, Thousand Oaks, and Ventura. What is Tree Root Invasion? Our team at Roto Rooter Venture specializes in clearing your pipes of any and all clogs and blockages. The most common type of pipe problem is caused by tree root invasion. 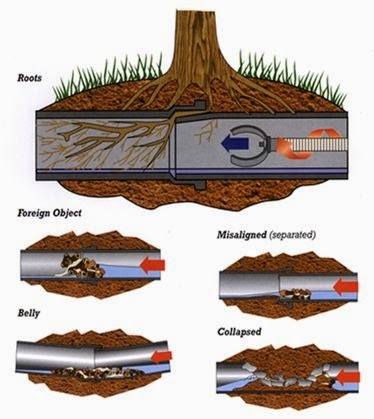 Tree root invasion is when tree roots intrude your pipe system. These intrusions can cause serious blockages and damage to your system if not fixed by an industry professional. Your pipelines are a constant source of water and nutrients for plants. Cracks and holes that form in your lines will release moisture that attracts these tree roots to your system. Once roots begin growing inside these cracks, it will cause them to expand and impact the functionality of your lines. Roto Rooter Ventura offers effective and affordable cleaning and inspection services for all of our Southern California customers. Keeping up-to-date on your pipelining system will extend their lifetime and help to catch any cracks before they are invaded by roots. Our team at Roto Rooter understands that each call is unique. Our team takes the time to accurately diagnose your pipeline’s problem and repair it quickly so that you and your family can live comfortably and avoid future repairs. An accurate inspection is vital to an effective approach. Roto Rooter uses trenchless camera technology to inspect your pipes from the inside, pinpointing the exact location of your tree root invasion. Once we have gathered detailed footage of the problem area, we can come up with the most cost-effective and lasting solution for your home. Hydro jetting is one of our most popular methods for cleaning pipelines and eliminating any stubborn clogs. This tool uses pressurized water to blast through tree roots and restore your pipeline’s flow. In the case of tree root invasions, we often recommend our pipe bursting and replacement lining method. This allows us to get rid of your damaged line and replace it with a new, strong one that can last up to fifty years. Both of these processes are completed internally so that we can avoid the cost and hassle of digging on your property. If your Calabasas, Camarillo, Fillmore, Moorpark, Ojai, Oxnard, Santa Paula, Simi Valley, Thousand Oaks, or Ventura property is at risk of a tree root invasion, Roto Rooter is ready to give you professional help whenever you need it. Call us today to find out more about our services we offer at Roto Rooter Venture and request a quote from our friendly associates.